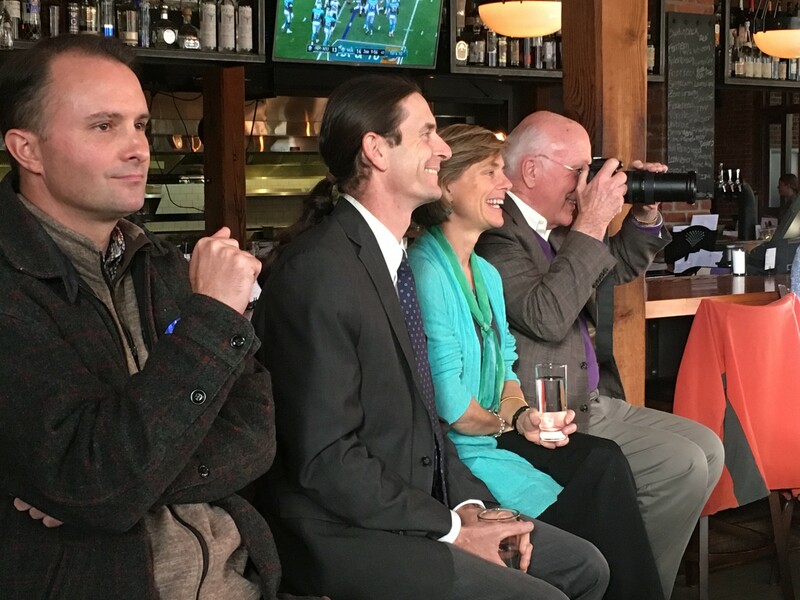 Fifty-one hours before the polls close in Vermont, Democratic gubernatorial nominee Sue Minter reflected on her political journey Sunday afternoon during a campaign rally at Burlington's Zero Gravity Craft Brewery. "I have had an extraordinary year — really, 13 months — traveling this state and meeting so many people in so many corners and, yes, learning about the incredible challenges we all face," the former transportation secretary told a crowd of 60 supporters in the dimly lit brewpub. "And to be at this point — two days away!" As Minter herself acknowledged, it was anything but clear whether she would prevail over Republican Lt. Gov. Phil Scott on Tuesday in her bid to become the 82nd — and second female — governor in the history of Vermont. "It is neck and neck, folks," she said. 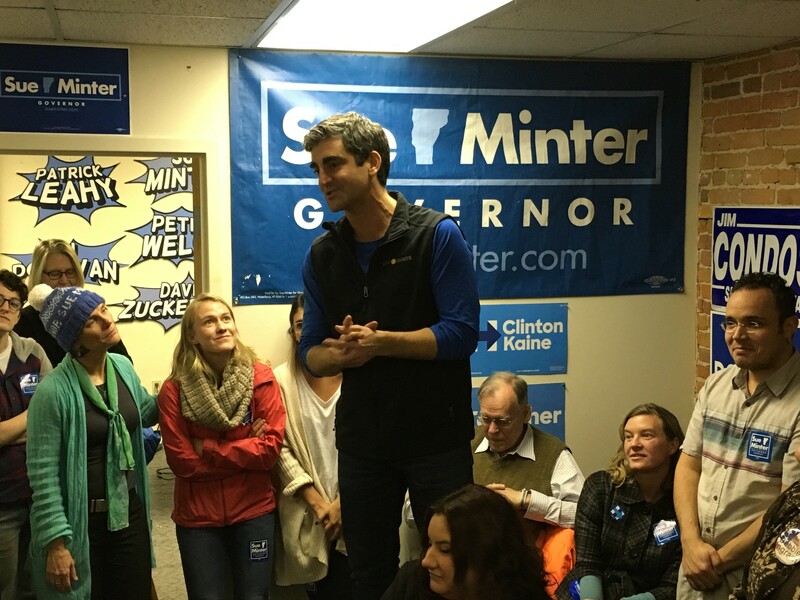 Minter and a band of top Democratic office seekers were near the end of a weekend-long sprint from Bennington to Windsor and from Middlebury to St. Albans. At Zero Gravity, she stood beside Sen. Patrick Leahy (D-Vt.), Democratic and Progressive lieutenant gubernatorial candidate David Zuckerman and Democratic attorney general candidate T.J. Donovan — and listened as they lavished praise on her. While Leahy, Zuckerman and Donovan will be on the ballot Tuesday, all three seemed to acknowledge that it was Minter who faced the toughest competition. "She is going to be the best governor in our state history," Donovan said, before turning to Zuckerman and saying, "Everybody needs a loyal sidekick." Zuckerman, a Chittenden County state senator, said he was more than willing to play that role. "I feel very fortunate that on the issues I've been talking about, Sue has been running all over the state, talking and listening about these challenges and struggles that Vermonters are facing," he said. 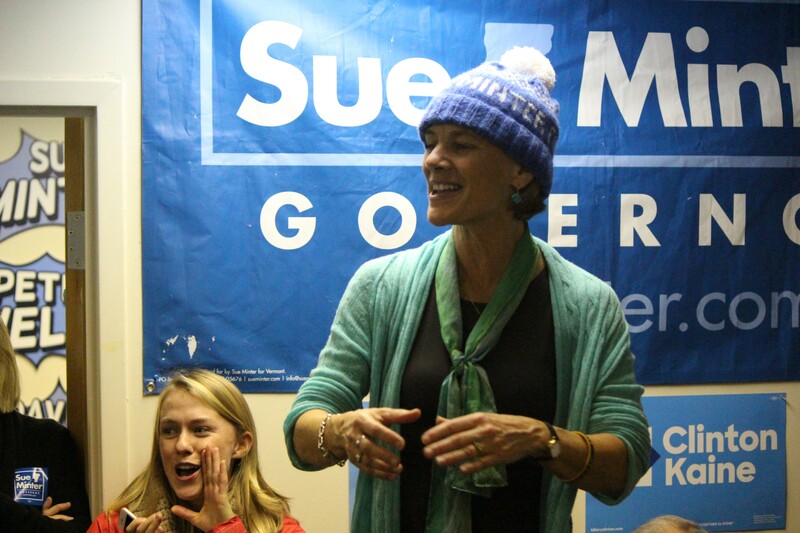 "And it is such an honor to be running as Sue's 'sidekick' — I think was the word — to be her lieutenant governor and work with her on all these issues." As the Democratic candidates made their way around Addison and Chittenden counties Sunday, a horde of volunteers and staffers activated the Vermont Democratic Party's vaunted get-out-the-vote program. According to VDP spokeswoman Christina Amestoy, they had knocked on 7,000 doors and placed 60,000 phone calls by 6 p.m. Sunday. "It's been a very hectic weekend," said VDP Chittenden County field organizer Doug Wemple, who helped direct 50 volunteers Sunday in his region. "We've seen a lot of people, especially this weekend, who are just so enthusiastic about Sue and other Democrats in the state. At the national level, you're seeing a lot of people who are upset with politics, but at the local and state level you're just seeing so many people excited." Charlotte Khamnei, a 16-year-old student from Burlington, counted herself among the excited. Though she isn't old enough to vote, Khamnei has interned for Minter's campaign since late August and spent Sunday organizing a phone bank at the VDP's College Street office in Burlington. "I've just become so passionate about her and what she stands for," Khamnei said Sunday evening during a brief break from the phones. "She's a woman in politics. She is a role model for me, because I'm someone who wants to work in politics. And she shows me, along with Hillary [Clinton] and so many other people, that, you know, women can work in politics." Sue Minter, left, looks on as Burlington Mayor Miro Weinberger addresses volunteers at the Vermont Democratic Party's Burlington office. Following the Zero Gravity event, Minter and her fellow candidates made their way to the College Street office to thank Khamnei and her fellow volunteers — and send them out on one more door-knocking shift. As the Democrats crammed into a tiny, windowless room, Natalie Silver — the VDP's regional field director for Chittenden and Franklin counties — introduced the pols and thanked the volunteers for their work. "A lot of you guys have been with us for six months. Some of you are coming here just for get-out-the-vote," she said. "But that is awesome, because get-out-the-vote is the most important time of this campaign." "Natalie has it right," the Chittenden County state's attorney said. "This is going to come down to field. And it's actually going to come down to Chittenden County. We need a huge turnout in order to get Sue Minter over the top." Minter, he said, had "done everything any candidate could possibly do — and a little bit more." "It's up to you," Donovan told the assembled Democrats. "It's up to you." Minter, now wearing a blue and white knit ski cap, stood on a folding chair and addressed the volunteers. "I am here to say thank you so much for getting me to this place and for being the incredible, tenacious, organized, dedicated, hardworking believers in what we can do for the future of this great state," she said. "While we don't have the Koch brothers, we have all of you." With the help of a few door-knockers and phone-callers, Minter said, she would soon become the next governor of the state of Vermont. "We are going to hold hands and run through the tape together," she concluded. "Because Tuesday is Sue's day!" Former Democratic gubernatorial candidate Sue Minter has landed a job as president and CEO of Special Olympics Vermont.